As summer is arriving many girls – myself included – will bring out the high heels, store away their flats and be outside for hours. But what effects does the heels really have on our body? 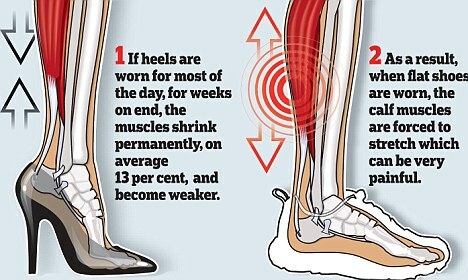 I myself have noticed some of these problems, since I’ve worn heels most if this winter too. If you walk a lot in heels the achilles’ tendon and the calfes gets used to be contracted, so that when you walk in flats you get pain in the areas because they are not used to being extracted, which usually makes you use heels even more and in the long run you can’t use anything else. Signs of these problems are that it hurts in your heels and calfes when you walk in flats and when you walk barefoot you tend to walk on toe and not putting the heel down at all. I know, this one is quit obvious. I don’t mean you should throw all your heels away and not usin anything but flats. Just limit the use. Do you really need heels to go to the store? What about for a shoppingtrip with your friends? At work? Limit the use of heels for parties, dates, and fancy occasions. If you have a job where you need heels occasionally, have a pair of flats to change into when you don”’t need it, and change into flats while walking to and from your workplace. If you need heels for your everyday job, try going for a 2,5-3 cm pair instead of a 7 cm pair. Also, broad heels are easier to walk in than slim. Not that your calfes knows the difference, but your feet will. If you do use heels alot and still feel the need to use them everyday, try buying a good par of walking/jogging shoes and take a walk/jog for at least 30 minutes every day. Or as long as your calfes can stand it – i found that when I switched back to mine, 10 minutes where my walking limit in the begining-. Talking from own experience. Switching from heels everyday to flats and walking upphill, OUCH! I had to lie down for an hour when I got home, and that was a 10 minute walk. I think my calfes are in bad shape. This is a good way of keeping the heels and saving your calfes and achilles’ tendons. Stand facing upwards on the first step from the bottom of a stair – higher steps work, but that might hurt a bit if you fall – stand with your toes on the step and your heels outside the step, hold on to the rail. Lower your heels below the edge of the stair with your toes still on the step, you should feel tension in your calfes. Hold for a while until you feel the tension relieve/become unbearable. Raise your heels, stand still for a while, repeat. Here you strech one leg at the time. Stand comfortably on the floor with your legs at shoulderwidth. With your left heel on the floor put your right foot forward and bend your knees until you feel that stretch on your calf. Hold for a while until you feel the tension relieve/become unbearable. go back to standing comfortably, stand still for a while,, switch legs, repeat. These are the exercises I do, of course there are other to. Do you have any more tips on how to stretch? Remember, moderation is the key!